Pear Note 1.4 is now out. Yes, I finally listened to all your requests and added image support to Pear Note. So, now you can drag in your diagrams of molecular structure, your pieces of art, or perhaps just a snapshot of the whiteboard your team just drew all over. 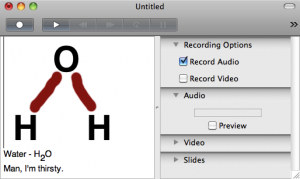 Also included in this release is the ability to Find in Slides. You could previously Find within the text of a document, but not the slides. 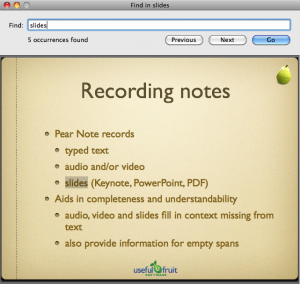 The new Find in Slides menu item means you can locate things in the slides as well as in the text. There are numerous other improvements, including a menu item for saving the default note location, the ability to export to RTFD, and a bunch of other improvements and refinements. I hope you enjoy it.